The book starts out with Nicole’s attack. She’s at school, trying to get to a class, when someone steps out in front of her and sprays her face with acid. In that moment, the beauty queen’s life changes forever. Jay is an outsider at school, plagued by his own problems, but when Nicole is attacked, Jay can’t just sit by and do nothing. Nicole and Jay become friends, and Jay becomes determined to find out what really happened to Nicole. This is the beginning of their story. This was my first Paul Griffin book and I have to be honest, it did not disappoint. I’m always cautious when reading new to me authors, but I’m also cautious when it comes to these types of mysteries. For me, it’s either hit or miss, there’s no in between when it comes to these stories. Well, Burning Blue is a definite hit! Jay is a strong complicated character, who has a lot of problems in his life. Despite everything, he stands true to his convictions and fights for those who can’t fight for themselves. I loved Jay because he was so dysfunctional! I know it sounds funny, but whatever problems he had, he didn’t let them define him and that’s what I loved about him. He pushed through his own insecurities, his own mishaps, to help someone he didn’t really know. In my eyes, that makes him a great hero. Nicole was an interesting character as well. I loved that she wasn’t just some airhead beauty queen who had her beauty taken from her and THEN she discovers who she truly is. No, Nicole has always had a soft heart, and she’s been searching for her own identity long before the attack. Nicole was a steady character throughout the book, growing just like a real person would, fighting through the adversaries of life. Jay and Nicole’s relationship was sweet and up front. I loved how real their interactions were, how personal their growth seemed. These characters leaped off the pages and spoke to you. Paul created an emotional, raw and real story folded in the pages of mystery. I had a few things figured out but some took me by surprise. I love when that happens in a book! I flew through this book and I’d recommend it to everyone, even if you’re not big on contemporary! 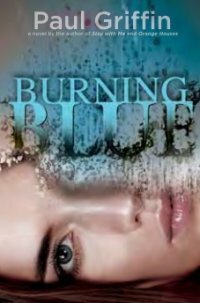 Burning Blue comes out October 25th, 2012! Buy it, read it, love it!